Don’t have all of the ingredients to make a fruit smoothie? No problem. 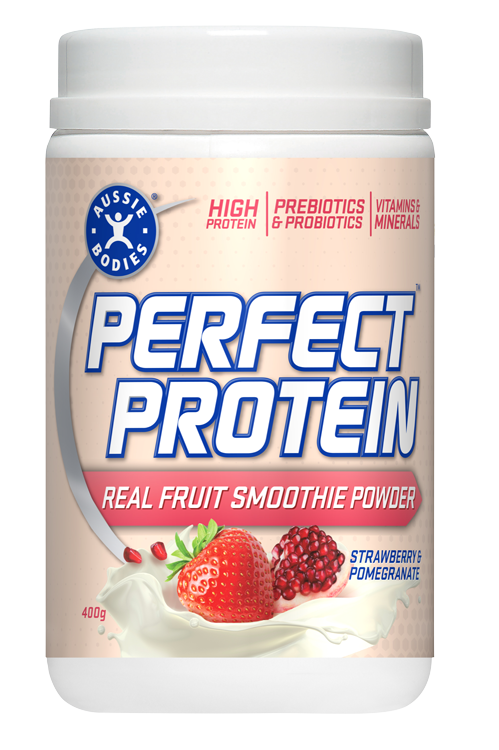 The Aussie Bodies Real Fruit Smoothie combines top quality protein, with fruit powder for a delicious smoothie. You just need to add water! One serve contains 18g protein, pre & pro biotics, digestive enzymes, vitamins & minerals, is a good source of fibre! Everything you need for a nutritious smoothie in one tub. Ingredients: Aussie Bodies® Protein Blend (80%) [Whey Protein Isolate, Whole Milk Powder, Skim Milk Powder, Whey Protein Concentrate, Emulsifiers (Soy Lecithin, Sunflower Lecithin), Prebiotic Corn Fibre (11%), Fruit Powder (4%) (Strawberry, Pomegranate), Vegetable Gums (Guar, Xanthan), Natural Flavours, Vitamin and Mineral Blend (Calcium, Phosphate, Magnesium, Zinc, Iron, Vitamin C, Vitamin E, Niacin, Vitamin A, Vitamin D, Vitamin B12, Vitamin B6, Riboflavin, Thiamin, Iodine, Folate), Acidity Regulator (Citric Acid), Digestive Enzymes (0.4%) (Bromelain, Papain), Natural Colour (Beet Red), Natural Sweeteners (Thaumatin, Steviol, Glycosides), Probiotic (Bacillus Coagulans).